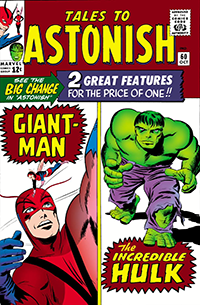 The tale for Giant-Man and the wasp (although just barely) for Tales To Astonish#60 is a communist fighting adventure titled “The Beast Of Berlin”. In this tale, Giant-man goes off alone (after telling her for the first time about how his wife died) to Communist controlled Berlin to rescue a friend captured by the communist as well as deal with the threat of a powerful weapon that he leaned about from the same friend. In some ways, is is the development of Giant-man’s back story, or at least the reinforcement that is the only strength to the early part of the story, as well as offering a way for the wasp to have an understanding of the often aloof attitude Hank Pym shows her. I found the artwork in this issue enjoyable, from the use of shadows, and colors to the details both on Giant-man and the world around him. Included here is just one segment with Giant-Man about to overcome his first obstacle of the trip, the Berlin Wall. In this scene, we see both great detail of the wall and the city on both sides of it, with just a few simple panels. I feel it invokes a feeling and emotion of the then reality. at least in a comic book form that is kept at least slightly lighter. But in any case, I would love to hear your feedback on this story, and its art, both the depth and the feeling conveyed.